If you're scouting for a casual yet dapper getup, try pairing a navy denim jacket with navy skinny jeans. Both pieces are totally comfortable and will look great paired together. To add elegance to your getup, complement with dark brown suede desert boots. If you're looking for a casual yet sharp getup, make a Givenchy buttoned jacket and grey plaid chinos your outfit choice. These two garments are very comfy and look incredible when worn together. Opt for a pair of black leather derby shoes for a masculine aesthetic. 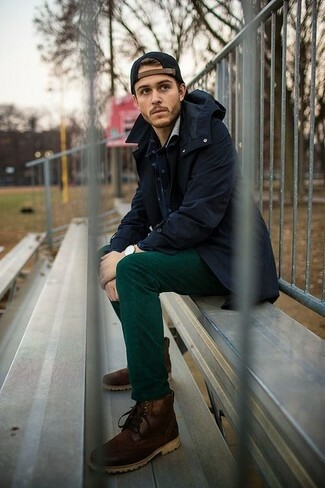 A navy denim jacket and dark green chinos are absolute staples if you're piecing together a casual wardrobe that holds to the highest fashion standards. Got bored with this ensemble? Enter dark brown leather casual boots to change things up a bit. This pairing of a Givenchy buttoned jacket from farfetch.com and a yellow cardigan is very easy to pull together in seconds time, helping you look stylish and ready for anything without spending too much time combing through your closet. A navy denim jacket and grey chinos combined together are a match made in heaven. 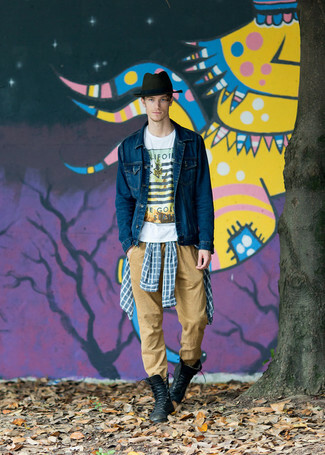 Our favorite of a multitude of ways to round off this getup is white low top sneakers. If you're on a mission for a casual yet dapper ensemble, try teaming a Givenchy buttoned jacket from farfetch.com with khaki chinos. Both pieces are totally comfortable and will look great paired together. Go for a pair of black leather casual boots for a masculine aesthetic. For a nothing less than incredibly stylish look, consider pairing a Givenchy buttoned jacket with charcoal dress pants. To bring out the fun side of you, complete your outfit with navy plimsolls. 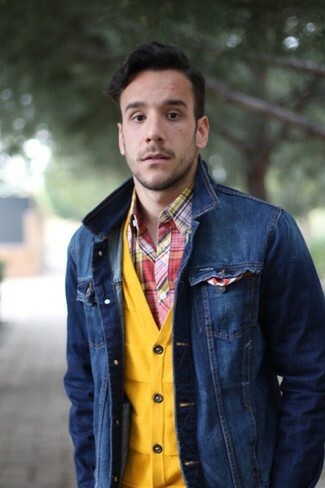 If you're in search of a casual yet sharp outfit, try teaming a navy denim jacket with navy jeans. Both garments are totally comfortable and will look great together. If you're on a mission for a casual yet stylish outfit, pair a navy denim jacket with black chinos. Both pieces are totally comfortable and will look great paired together. Sporting a pair of black leather chelsea boots is a simple way to add extra flair to your look.